integrity committees in Creating a Culture of Academic Integrity. 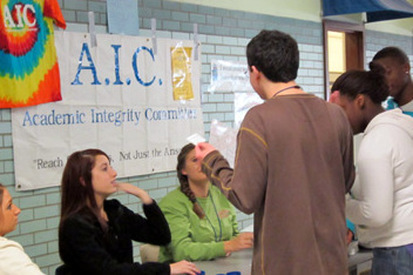 AIC conducting Integrity Pledgedrive as described in Toolkit. Every middle and high school should have a committee dedicated to monitoring and supporting a school culture of integrity. This Toolkit​ is an indispensible resource for that committee. Research studies note approximately 95% of public high school students participate in some form of academic cheating during the average school year. High schools are in critical need of leaders who will act to reverse this trend. School leaders can take steps to support authentic teaching, learning, assessment and a culture that encourages ethical citizenship. The Toolkit was created to provide clear strategic steps for school leaders in support of academic integrity and to resist cheating.